There was once a time when counterfeiting currency was a rare skill. But when color copiers and digital scanners became commonplace suddenly anyone with compromised ethics could try their hand at counterfeiting money. 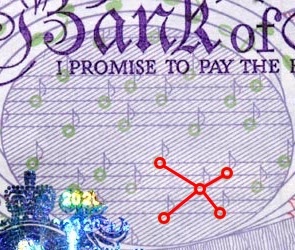 One curious way that governments tried to circumvent this was to incorporate a sort of digital watermark called the EURion constellation into official bank notes. This pattern consists of five rings arranged in a specific relationship to one another (see illustration). The software that was commonly used in color copiers, scanners and printers was modified to detect this constellation and would refuse to function. The name EURion is a tongue-in-cheek portmanteau of EUR (for the Euro currency) and the Orion constellation (which the pattern does have a passing resemblance). Famously, Adobe Photoshop, an obvious tool for the would-be modern counterfeiter, adopted this detection code in its software and will refuse to allow the user to edit a document that it has determined contains the EURion constellation. A number of countries have been incorporating the pattern into their national currencies (over 50 currencies) beginning in the late 1990’s. Many times the pattern itself is disguised or blended in to the art of the bank note. United States currency for example have fields of their bills that appear to be numbers scattered seemingly randomly about. 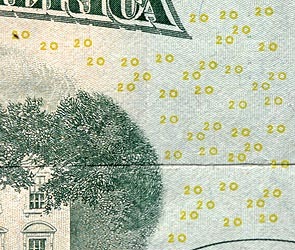 On the back of the twenty dollar bill the number “20” can be seen spread across the left and right halves of the bill. The placement of the zeroes however is very deliberate and forms the EURion constellation in many places. Numbers on back of a U.S. Twenty Dollar bill. Sample EURion pattern connecting some of the zeroes. 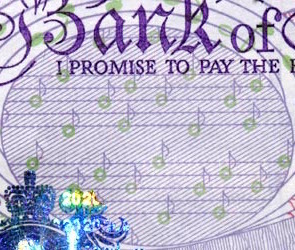 Musical notes on back of a U.K. Twenty Pound note. Sample EURion pattern connecting the musical notes.